“Rethinking Judgements on Post-Truth through the Performance of Affective Toning, Contagion and Aesthetic Delight.” Seminar sessions with artist Mikey Georgeson at #SSASS ANIMATIONS AND PROVOCATIONS, Society for the Study of Affect Summer School, July 29 to August 02, 2019, Lancaster PA, USA. Keynote at Digital Ecologies II: Fiction Machines. One-Day International Symposium: Tuesday July 16th 2019, The Centre for Media Research, Bath Spa University. See call from proposals. Co-organizer of the third CERG Silvertown Session on “Community Wealth Building” at RDLAC, North Woolwich on 9th May. Invited talk at the “Emotion by Design: Communication & Affective Environments” Research Seminar, 23rd April, The American University of Paris. Invited talk at the Department of Media, Culture, Heritage annual seminar series at the School of Arts and Cultures, Newcastle University on 27/02/19 – more details to follow. Invited talk at the Berlin Transmediale 2019, taking place at HKW from the 31st of January to the 3rd of February. Talking on a panel with Hyphen Labs on neurocultures, structures of experiences and other topics – more detail here. Co-organised the second Silvertown Session in North Woolwich, London on evening of 22nd Nov on topic of Rengeneration. Confirmed guest speaker Anna Minton. 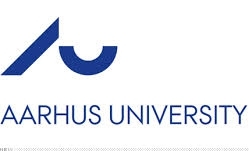 Paper “Whitehead does HCI: Temporal Tools for Interaction Spaces” at the Affects, Interfaces, Events conference, August 29th – 30th 2018, Godsbanen, Skovgaardsgade 3-5, Aarhus University, Denmark. Organizer and speaker (on collective impulses) on the Neuroaffect stream at Capacious: Affect Inquiry/Making Space, August 8 to 11, 2018, Millersville University’s Ware Center, Lancaster, Pennsylvania, USA. First Silvertown Sessions: Introducing Food Cultures/Histories/Policies: Flavours of the Docks. A Cultural Engine Research Group (UEL) event at the Royal Docks Learning & Activity Centre in North Woolwich, London, Weds 4th July. Invited talk at “How to Approach a Problem like Cambridge Analytica through Interdisciplinary Research” presentation at the opening session of the UEL Research and Knowledge Exchange Conference: Interdisciplinary Case Studies, 28th June, 2018. The Cultural Engine Research Group present Collaborative Enterprises: From Conferences to Social Labs – Panel presentation at the UEL Research and Knowledge Exchange Conference: Interdisciplinary Case Studies, 28th June, 2018. “Revisiting Viral Love” – Speaker – via video link – at Actual Occasion: a Webinar and Groupchat art installation by Mikey Georgeson (see above) at UEL’s AVA Gallery 15th June 2018. Co-organizer of the Cultural Engine/Essex County Council/UEL conference Resorting to the Coast: Valuing the Past to Shape the Future, Friday 27th April 2018 at the Columbine Centre, Princes Esplanade, Walton-on-the-Naze, Essex. CO14 8PZ. Co-organizer of Club Critical Theory’s Seaside Cultures, Upstairs at the Railway, Southend, Fri 17th November. Invited talk “Tap My Head and Mike My Brain: Neuromarketing and Addiction” at Central Saint Martins (University of the Arts, London) on Tues 7th November at a special public symposium to discuss a new book called Are We All Addicts Now? co-edited by Vanessa Bartlett and Henrietta Bowden-Jones (Liverpool University Press, Sept, 2017). Keynote Panel talk at “VIRAL/GLOBAL Popular Culture and Social Media: An International Perspective” (see below). The University of Westminster Communication and Media Research Institute (CAMRI), Sept 13th 2017. Speaker and co-organiser on the “Assembling Empathy” panel at the SLSAeu Empathies conference at the University of Basel on 22nd June 2017 with Greg Seigworth, Darren Ellis and Ian Tucker (see below). “Food is Culture” Co-organizer and introductory speaker at Club Critical Theory’s Food Cultures: A Food Plan for Southend at The Focal Point Gallery, The Forum, Southend, Essex, 10th June, 2017. Organizer and host of the Affect and Social Media#3 conference (see below), University of East London, 25th May 2017. Invited talk at Trauma of the Anthropocene. Discussants: Mateusz Chaberski (moderator, Jagiellonian University), Mateusz Borowski (Jagiellonian University), Tony D. Sampson (University of East London), Małgorzata Sugiera (Jagiellonian University) at Traumatic Modernities. From Comparative Literature to Medical Humanities Centre for Advanced Studies in the Humanities at the Jagiellonian University, Kraków, Poland, April 19-21, 2017. Keynote at the Rietveld Studium in Amsterdam at an event called What is Happening to our Brain? on Tues 8th Feb 2017. This event is open to the public and includes Franco “Bifo” Berardi. Talk on the Assemblage Brain. A book launch collaboration with artists Mikey Georgeson as part of Georgeson’s The Deadends exhibit at the Studio One Gallery in South West London on Thurs 23rd Feb, 2017. Invited talk (see below) at roundtable symposium at the University Lincoln, UK, on the theme of ‘Cybernetic Subjectivities and the Mediation of Trust and Empathy’. Inaugural founding event marking the establishment of the Centre for Entangled Media Research, hosted by the School of Film and Media, University Lincoln, UK, 24th-25th May. Plenary speaker at Streams of Consciousness: Data, Cognition and Intelligent Devices conference at Centre for Interdisciplinary Methodologies, Warwick University, 21st and 22nd of April 2016 (see top of page). Hosting the Affect and Social Media#2 at UEL Docklands on 23rd March 2016. Talk at a Club Critical Theory special at Conway Hall, Red Lion Square, London 3rd March 2016. A response to Conway Actants by artists Deborah Gardner and Jane Millar. Invited talk “Waking the Somnambulist: The Capture of Affect, Attention and Memory (and why we need new weapons to stop it)” at The Image of Network symposium, Winchester School of Art (Southampton) organized by Yigit Soncul and Jussi Parikka, Tuesday June 16, 2015. Invited talk at the Vital Mobilizations: Care and Surveillance in the Age of Global Connectivity conference at the Collège d’études mondiales, Paris, 1-2 June, 2015. “On Crowds, Publics and the Potential of Assemblages.” An introductory talk at a pre-election Club Critical Theory special event called Where is the Common Ground: Making Local Activism Work In Southend, Upstairs at the Railway Hotel, Southend-on-Sea, Sunday 3rd May, 2015. Organiser and chair (see below) for the Affect and Social Media#1 at UEL, Docklands campus, Friday 27th Feb, 2015. Paper “Start Spreading the News: Audiences, News and Contagion”, From Multitude to Crowds in Social Movements – publics, gatherings, networks and media in the 21th century, 26-27 January, Catholic University of Portugal, Lisbon, 2015. Invited talk “The Rhythmic Brain: Attention Deficit and the Care of Youth” at Concerning Relations: Sociologies of Conduct, Care and Affect Symposium, Exeter Medical School, University of Exeter, 28 – 29 November 2014. Chairing Club Critical Theory discussion on “Kursaal as Heterotopic Space” with Angie Voela (UEL) and Jane Millar (artist and curator), 2014. Keynote (see below) at the “Cultural im/materialities: Contagion, affective rhythms and mobilization” PhD summer school at Aarhus University, Denmark 25th June, 2014. In recent years an increasing interest in materiality, space, technology and embodiment has developed in the humanities and social sciences combined with an ëaffective turní (Clough, Massumi, Thrift, Seigworth and Gregg, Ahmed) to immaterial dimensions of these phenomena. This has re-actualised early sociological theories about affective suggestion, contagion and imitation (e.g. Gustave Le Bon and Gabriel Tarde), which offer valuable insights to the analysis of a contemporary cultural landscape characterised by for instance viral/memetic phenomena, mediated/networked/rhythmically coordinated crowds, affective online communication and political modulation of citizen affects (Blackman, Borch, Gibbs, Sampson, Butler). During the summer school we wish to collectively explore the immaterial dimensions of the material social world and vice versa, discuss the potentialities, implications and risks of such analysis in an open interdisciplinary environment. 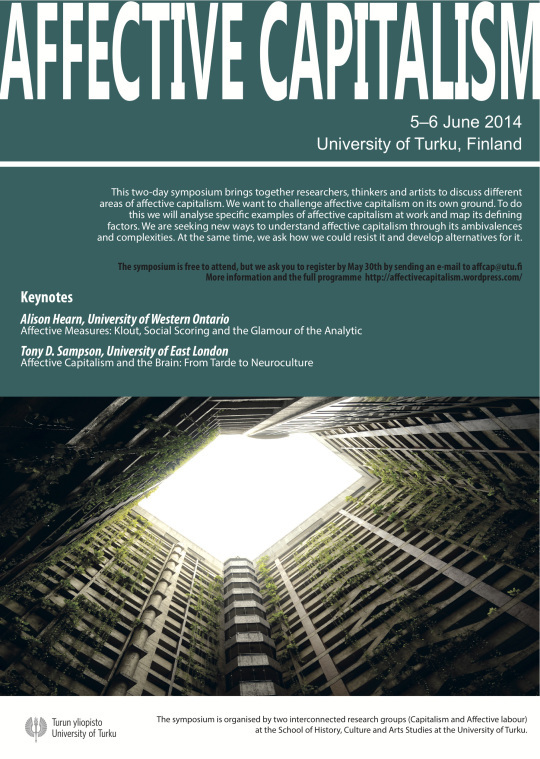 Keynote (see below) at the “Affective Capitalism” symposium at University of Turku, Finland, June 5-6, 2014. This symposium aims at describing and understanding a regime we call affective capitalism. In cultural theory, affect is considered to be a fruitful concept in analysing how something evokes our body and mind. Affect makes us act. Affect exceeds or precedes rationality. In our daily lives we are constantly affected by a plethora of things; our work, our friends, our surroundings, our technologies (Gregg & Seigworth 2010). Unsurprisingly perhaps, we are seeing attempts to capture affect in different fields of contemporary culture from labour to social networks and politics. In these contexts, affect and affection are in an extensive manner organised, produced, and maintained for the needs of capitalism. Affective capitalism is lucrative, tempting and even sneaky. It merges with established therapeutic discourses and blurs the limits of intimacy at work (Ross 2003; Illouz 2007; Gregg 2011). It is both cognitive and non-cognitive (Sampson 2012); we are being evoked to act in order for companies to make profits in a market economy. Affective capitalism transforms us into assets, goods and services by appealing to our desires, needs and social relationships, or by making us act on a mere gut-feeling. This two-day symposium brings together researchers, thinkers and artists to discuss different areas of affective capitalism. We want to challenge affective capitalism on its own ground. To do this we will analyse specific examples of affective capitalism at work and map its defining factors. We are seeking new ways to understand affective capitalism through its ambivalences and complexities. At the same time, we ask how we could resist it and develop alternatives for it. Invited talk “From Taylor to Neurolabour: Continuities and discontinuities in the three paradigms of HCI” guest talk HCID 2014 at City University, April 23rd, 2014. “Deleuze, Contagion and the New Brighton” guest talk at Club Critical Theory, upstairs at The Railway Hotel, Southend-on-Sea, Essex. April 17th, 2014. 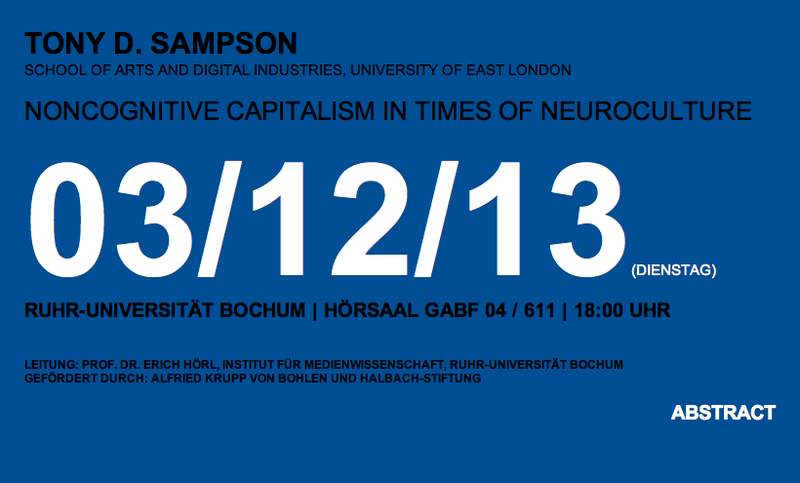 Invited talk (see below) at the Bochum Colloquium for Media Studies (bkm) hosted by the Institute of Media Studies at the Ruhr University Bochum, Germany. 3rd Dec, 2013. Invited talk and panel member at the Meme Control event, the Future Human Salon, 7-9.30pm, Nov 20th at The Book Club, Shoreditch, London, 2013. Invited talk “Memes, spam, nodes, moods and super–clusters of attention” at the Centre for Cultural Policy Studies, University of Warwick, 15th Oct 2013. Paper “Leaking Affects and Mediated Spaces” at the Fourth International and Interdisciplinary Conference on Emotional Geographies at the University of Groningen, the Netherlands, 1-3rd July 2013. Invited talks and workshops “Virality, Chaos and the Brain” for events organized by The Bureau of Melodramatic Research based in Bucharest – 22nd-23rd June, 2013. Invited talk on Virality as part of the “I am Algorithm” show by the artist Charlie Tweed at the Aspex Gallery in Gunwharf Quays, Portsmouth, 19th June 2013. Invited talk “Too Much Connectivity” at Brunel and Oxford Brookes University series on Networks and Society, Friday 24th May 2013. Invited talk “From Virality to Neuroculture” at the Contagion: transforming social analysis and method workshop, Dept in Geography, Exeter University, 13th-14th May, 2013. “Anomalies, Archaeology and Contagion” discussion with Jussi Parikka and Tony D. Sampson at Kings College, London, 20th March 2013. Invited talk “Tarde’s Phantom Takes a Deadly Line of Flight” at The Operations of the Global – Explorations of Dis/Connectivity Conference, Warburg-Haus, University of Hamburg, 6th-8th October 2011. Panel speaker “Press Delete’ The Politics and Performance of Spamculture” at the International Symposium on Electronic Art (ISEA), Dortmond, Germany, 23 to 27 August 2010. Invited talk “Viral Love” at the Thinking Network Politics: Methods, Epistemology, Process Conference, ARU, Cambridge, 25 & 26 March 2010.